Bpyan Doychev took his first musical steps at “Marin Drinov” middle school in the guitar calss of Stanimir’s Dikov in Varna. 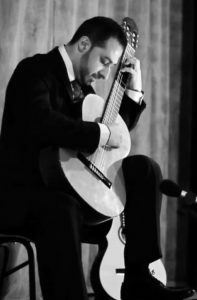 He studied at the National school of arts “Dobri Hristov” from 1998 to 2007 in guitar classes of Liuben Haralambiev, Sevdalin Stefanov and Neli Nedeva. Between 2007-2013 he studied for his bachelors degree at the National Academy of Music “Pancho Vladigerov”, Sofia) in the guitar class of Rossen Balkanski. Doychev has participated in masterclasses with George Vassilev, Stefan Goss, Serjio Gomez, Eva Fampas,Mihai Cojocaru, Gerhard Reichenbach, D.Eduardo Pascual, D.Carlos Alonso, Andreas von Wangenhein, Sania Milotinovich, Constantin Andrei , Urosh Doichinovich, Rossen Balkanski,Adrian Andrei, Catalin Stefanesku, Gabor Podhorski, Liviu Georgescu , Claudiu Lobont, Carles Guisado, Judicael Perroy, Natalia Lipnitskaya, Anton Baranov, Stefan Trifan, Olivia Lancu,Carlo Marchione,Oman Kaminsky, Thomas Offermann, Costas Cotsiolis and others.